So I was deliberating the difference between sweet and savory today after looking at a recipe for bacon brittle. Artery clogging for sure, but it does sounds appetizing and definitely not for the faint of heart. The recipe sparked interesting thoughts of other savory flavors that could shockingly translate into sugary goodness. 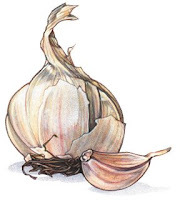 My mind wandered over to the vampire fighting bulb, garlic, a flavor so intense, could it ever lend itself to add an interesting depth to a tart or a cookie. I think anything is possible and there are no boundaries when it comes to food and flavors. So I decided to create a recipe that would work. I will admit that it is just theory, but someday I will test it out. Right now my kitchen is lacking all ingredients except sugar and garlic, so this recipe will have to wait until I stock up on the basics. The brown sugar gives the cookie a richer and earthier flavor that lends itself as a better companion to the strong flavor of garlic. However, roasting the garlic makes for a mild flavor. Preheat oven to 325 degrees F. Cream butter, garlic and brown sugar. Add 3 to 3 3/4 cups flour and the rosemary. Mix well. Sprinkle board with the remaining flour. Knead for 5 minutes, adding enough flour to make a soft dough. Roll to 1/2 inch thickness. Cut into 3x1 inch strips. Prick with fork and place on ungreased baking sheets. Bake at 325 degrees F (165 degrees C) for 20 to 25 minutes.